COMMENCE FREAK-OUT NOW: J.K. Rowling has posted a new addition to the Harry Potter series on her website Pottermore. 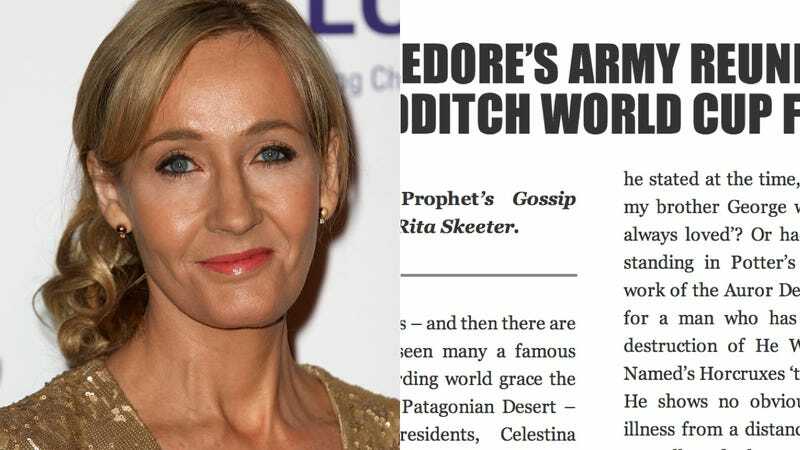 It takes the form of a gossip column written in the voice of Rita Skeeter. As first reported by Bookseller, while Rowling has written books and bits about the Harry Potter universe since publishing the last book, this is the first time she's addressed how these characters have developed as adults since the epilogue. The piece covers Skeeter reporting on the (well-timed) Quidditch World Cup attended by Dumbledore's Army. Skeeter speculates about Harry Potter's "nasty cut over his right cheekbone" (and snarks about how he's still wearing his round glasses "that some might say are better suited for a style-deficient twelve-year-old"). She also suggests Harry and Ginny might be having marital problems and that Harry and Viktor Krum might have once been lovers! According to Skeeter, Ron is balding and in business co-managing Weasleys' Wizard Wheezes, which happened "only two years" after he started as an auror. Neville Longbottom and his wife might drink too much. Bill and Fleur Weasley's daughter Victoire is "snogging" with Teddy Lupin all over the place.